The Loyola Ramblers have been on an improbable run to the Final Four, starting out as an 11th seed and beating four opponents, all ranked above them. After beating Kansas State 78-62 to become only the fourth 11th seed to make the Final Four, it’s worth considering that perhaps it was the tournament organizers who screwed up their work by seeding Loyola too low. Keep in mind that this was a team that went 31-5, won the Missouri Valley Conference, was 12th in the nation in defensive rating and had, Clayton Custer, the MVC player of the year, on their team. 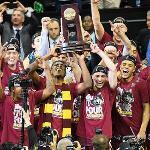 The Ramblers have reached the Final Four playing a very modern style of offense as head coach Porter Moser has been able to exploit the way most college teams still defend the pick-and-roll with the high hedge. Loyola also benefits from having a great guard such as Custer. Even though his numbers are not off the charts, he is always under control, makes very wise decisions on the go, is an outstanding long-range shooter and gets his teammates involved with crisp and very accurate passes. He knows how to push the ball up without forcing anything, is patient and knows how to seek the best openings to finish with a layup or shovel a pass to the open man for the corner three. Custer has also already proved his calm and demeanor in tough moments. He’s capable of last-second heroics as he proved with a thrilling buzzer beater in the second round against Tennessee, which allowed them to advance to the Sweet 16. Loyola plays a defense based on switching most screens and confusing their opponent’s attack, which leaves them no choice but to take long, rushed, and often contested three-point shots as the shot clock winds down. Loyola is also very well coached on their defensive rotations limiting the options that the opponents can get in the low post. Their tight and well-organized defense often makes opponent panic as it forces offensive players to head back to the perimeter to reorganize and search another point of attack as time runs out. Now it’s the turn of the Michigan Wolverines to try to end the Ramblers’ improbable run to the National Championship game, but that won’t be easy because coach Moser has this Loyola team believing it can accomplish anything, and most importantly, it has shown the ability to refocus after the big wins.